Amiga Music Preservation hosts a great amount of modules (mostly in Amiga formats) and has a comprehensive demoscene musician database. modules.pl is a Poland-based module community. At SOAMC, you can listen to Amiga mods the way they were meant to be played - through an Amiga! The Mod Archive is one of the largest and oldest module sites out there. Here you can upload your own music or review other musicians' creations. Buzz is a powerful modular tracker. MilkyTracker is a FastTracker 2 clone, available for many different platforms. 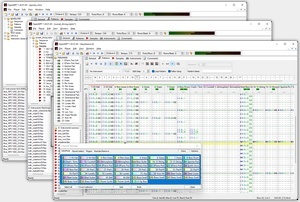 Renoise is an advanced third generation tracker available for several platforms and suitable for modern music production. Schism Tracker is an Impulse Tracker clone resembling the look and feel of one of the best trackers ever on many different platforms. XMPlay is a versatile audio player that does not only have one of the best module playing engines out there, but also offers good support for streamed music formats like MP3, OGG and FLAC and also more obscure formats. XMPlay can be extended to play even more tracked music formats with our xmp-openmpt input plugin! Bitfellas is a huge demoscene platform, featuring an online radio. Nectarine was the first 24/7 demoscene radio - and it's still alive! SceneSat focuses on the modern side of the demoscene. Being last edited in 1999, The MOD FAQ might be a bit outdated by now, but is still an interesting read. The Tracker History Graphing Project illustrates the history of music trackers from their beginnings in the late eighties to the present.